Relax in this luxurious Aston BT686-II 67 in. x 35 in. Acrylic fibreglass-Reinforced Slipper Claw Foot Tub with tub-mount Faucet. An over-sized version of the traditional size, you are sure to enjoy the extra depth and width of this beautiful model. Classically styled after the cast iron design, but this model allows for easy manoeuvreability within the bathroom. 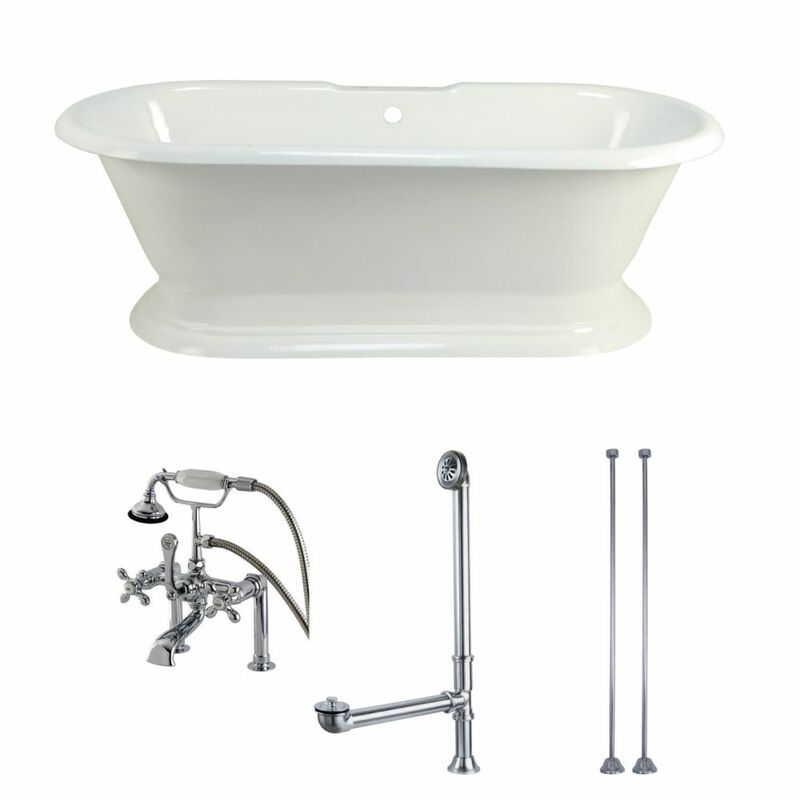 Enjoy the ageless design of this tub and add elegance with the included tub mount, chrome-finished Victorian-styled faucet. The convenient hand shower sums up the many features of this tub. This is a perfect bath solution that brings a stylish focal point to any modern or classic bathroom. Pedestal 5.6 ft. Acrylic Flat-bottom Bathtub in White and Faucet Combo in Chrome The Double Slipper 67 inch acrylic bathtub will surely be the center point of your bathroom. The double slipper design allows either end to be used. Modern and vintage designs are merged together with the pedestal base. Includes tub, faucet, drain and supply lines. Pedestal 5.6 ft. Acrylic Flat-bottom Bathtub in White and Faucet Combo in Chrome is rated 5.0 out of 5 by 1. Rated 5 out of 5 by Bgb from This tub is beautiful!! We remodeled our bathroom and replaced a whirlpool tub with this one. It ... This tub is beautiful!! We remodeled our bathroom and replaced a whirlpool tub with this one. It was very easy to install and looks amazing!!! !